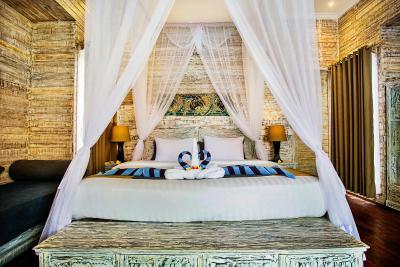 Lock in a great price for The Palm Grove Villas – rated 9.1 by recent guests! I love the breakfast - it was delish! I also liked the ambience and the view from my room. I like the food, the stuff was very friendly and the facilities were pleasing! 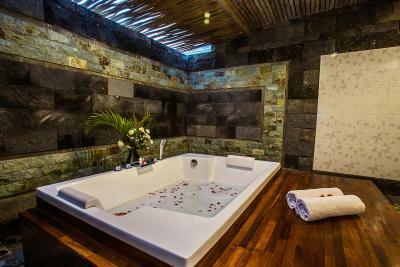 Very spacious room and wonderful outdoor bathroom. Patio outside the room where you can chill and have a drink. Pool was right in front but you still had privacy. 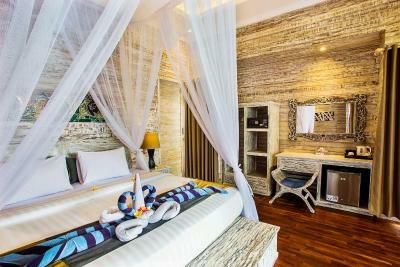 Bed was made and towels were changed every day. Staff was excellent, always a smile and a nice word to say. Breakfast choices were amazing and the overall menu at the restaurant was very good. We got a package that included a free foot massage and lunch. 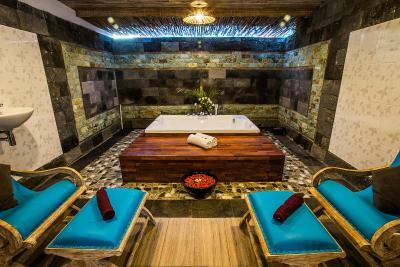 The spa facilities were very good. The beach near the hotel is not the best for swimming, but you can rent a scooter and explore the island for other beaches (will not take you more than 20 minutes to get to the far end). All in all, very good value for money for a quiet, relaxing weekend. Stunning environment, the hotel is so clean and fresh. The bed is so so so comfy and everything looks sparkling. Right near the beach and the staff really look after you. 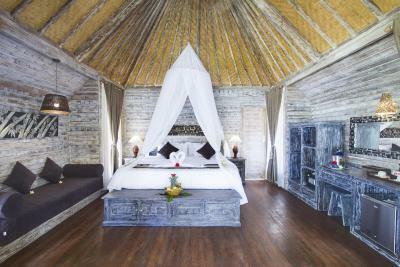 Gorgeous room & setting, wonderful friendly staff. 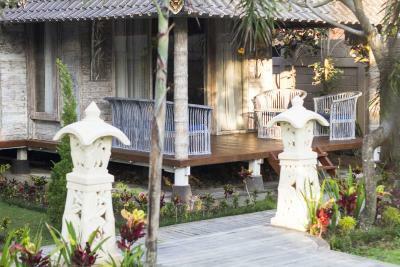 It was the cleanest villa we've ever had in Bali during our 3 weeks trip. We felt very comfortable! That villa and the pool were amazing. Bed was a super king size and so comfy. Outside shower and toilet were so clean and wonderful to use. The hotel room gardens and pool were beautiful and clean. The staff was very friendly. Located very close to Mushroom Bay. The Palm Grove Villas This rating is a reflection of how the property compares to the industry standard when it comes to price, facilities and services available. It's based on a self-evaluation by the property. Use this rating to help choose your stay! 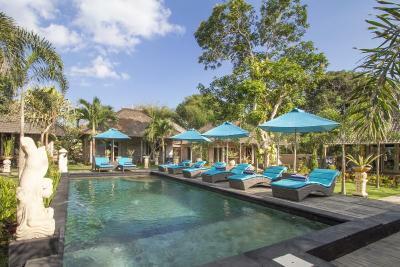 One of our top picks in Nusa Lembongan.Located 350 feet from Mushroom Beach in Lembongan, The Palm Grove Villas features private villas with private entrances and traditional Balinese thatched roofs. 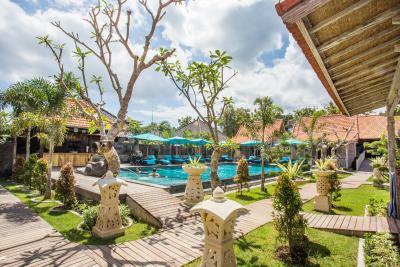 Located near diving spots, the resort offers 2 outdoor swimming pools and a spa center with a variety of relaxing treatments. 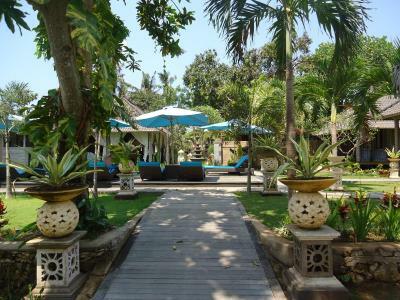 The Palm Grove Villas is located on Lembongan Island, a 30-minute speedboat ride from Sanur Beach. 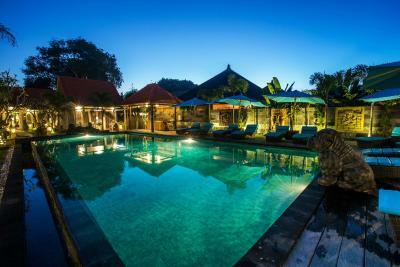 The journey from Sanur Beach to Ngurah Rai International Airport takes an hour. 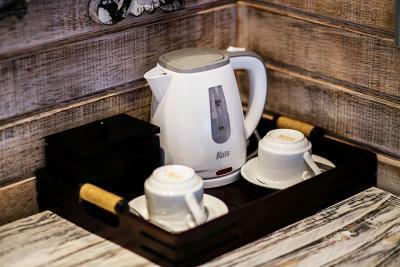 Villas provide tea/coffee making facilities and a safety deposit box. 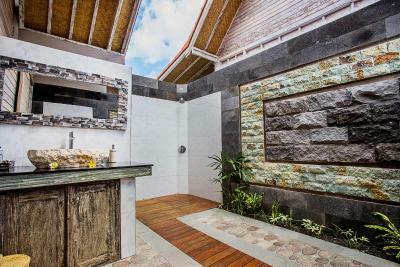 Open-air bathrooms come with pebbled flooring and shower facilities. Bicycles and cars are available for rent. 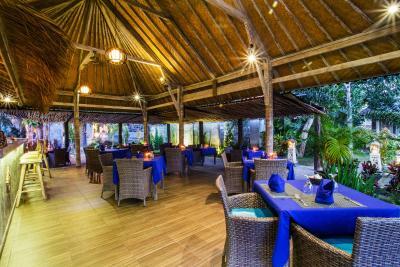 The property also houses a restaurant that serves breakfast, lunch and dinner. Romantic candlelit dinner can be arranged upon request. 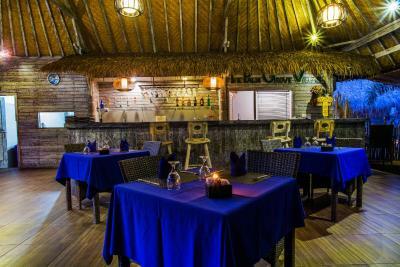 For other alternatives, various dining options are available a short walk from the property. 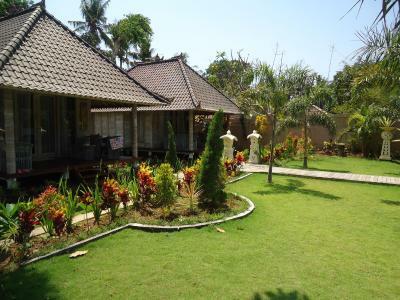 This property is also rated for the best value in Nusa Lembongan! Guests are getting more for their money when compared to other properties in this city. 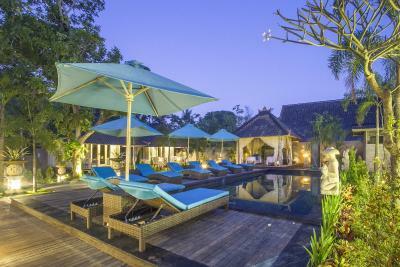 When would you like to stay at The Palm Grove Villas? 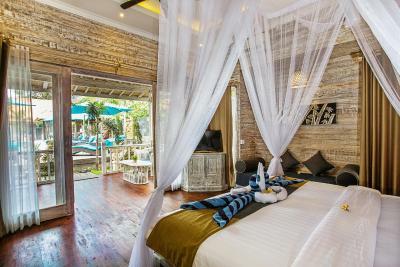 This air-conditioned double room features a garden view and fitted with a mini-bar, seating area, balcony and an private bathroom with hot and cold shower facility. Guests enjoy daily afternoon tea. 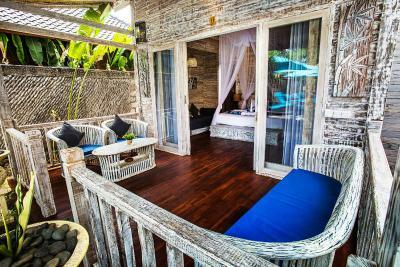 Featuring a private balcony, this air-conditioned room has a safety deposit box, mini-bar and tea/coffee-making facilities. Daily mineral water and afternoon tea are provided free of charge. 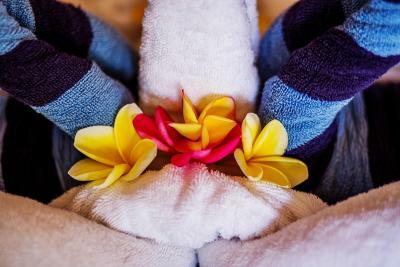 Guests enjoy complimentary 1-time lunch for 2 people and 1-time, 15-minute foot massage per stay. 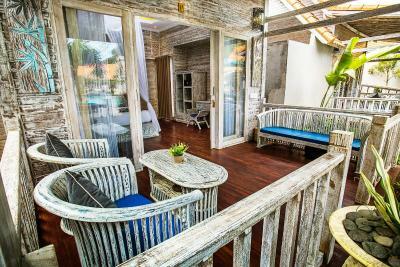 This double room features a balcony, private entrance and seating area. This suite features a balcony, private entrance and seating area. 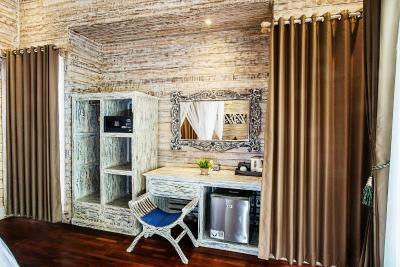 This suite has a balcony, air conditioning and mini-bar. 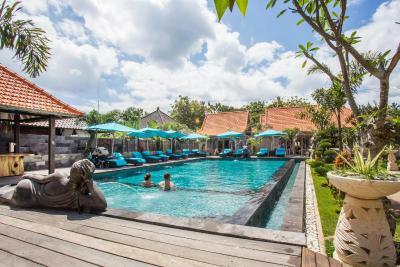 Our property is newly refurbished wooden house, large garden area is perfect for family with kids, or chill out by turquoise swimming pool. The famous Mushroom Beach is only 5 minutes walk. 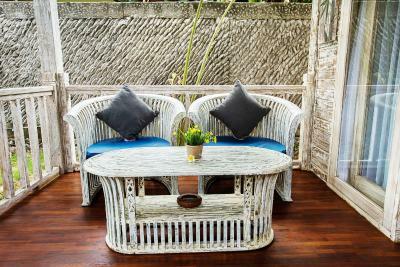 House Rules The Palm Grove Villas takes special requests – add in the next step! The Palm Grove Villas accepts these cards and reserves the right to temporarily hold an amount prior to arrival. Please note that Nyepi Laut (Ocean Silent Day) will be observed on 25 September 2018. Sea-crossing to Lembongan and Nusa Penida is prohibited and no sea-related activities can be performed on the islands on that day. Would have been better if we have cooler air conditioner. The shower did not have hot water, but we have learned to deal with it that. Otherwise, the bathroom was very clean and more than acceptable. The place was great! The room was very cute, clean and most importantly cool. The aircon worked great! The pool was very nice and relaxing and we had it to ourselves most of the day. 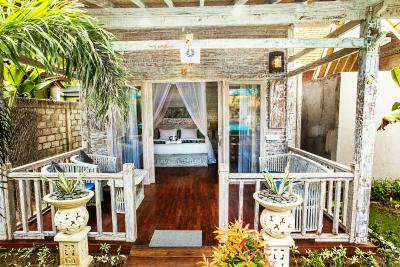 We stayed at 2 other places on Lembongan and this was by far the best! I highly recommend!! 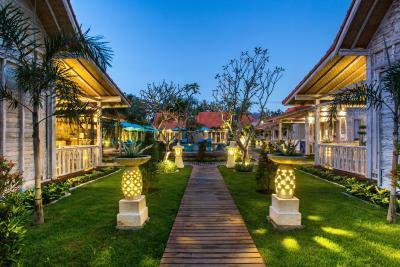 The restaurant and bar were excellent value for money, delicious and generous in size, so much so that offer we opted to stay in rather than explore. The staff were always friendly and helpful and remembered us by name. When booking activities out side the hotel they gave us great advice and very cheap rates (approx $20 per person for a snorkelling trip). Our rooms were right next to the pool, which was clean and we'll maintained. 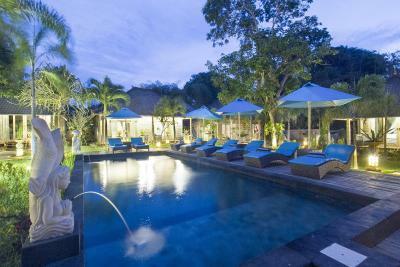 Staff were happy to bring food and drinks around to the room or poolside, which made the experience that much better. Airplanes going on top all the time, but that has nothing to do with the hotel. But at night time it can be noisy. Everything closes really early (10pm) everywhere in the island. 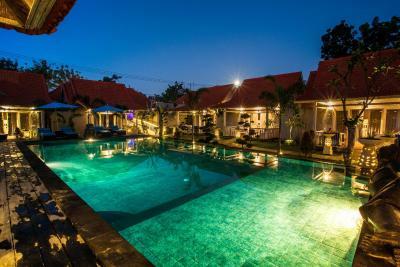 Nice atmosphere, relaxed and quiet hotel. Clean and new. Two nice pools, nothing to complain. Breakfast was good, many options, but a bit slow waiters and they had a bit short memory. 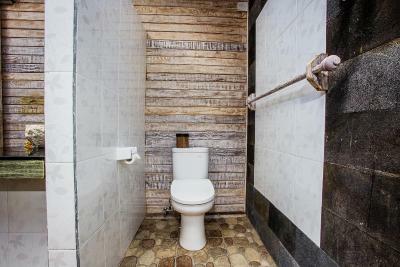 Toilet and shower are outdoor, maybe not a big problem during good whether but on a rainy day it’s not convenient at all. The restaurant LGood Bar & Grill right opposite the property hosted performance every night until about 10pm, so if you are not a night person you may mind this - although their food is actually not bad. Limited options for breakfast and the portion is not big. For lunch/dinner the food is just so-so, after one meal with the hotel restaurant we decided to go out for lunch/dinner which the restaurant can usually pick you up and send you back. 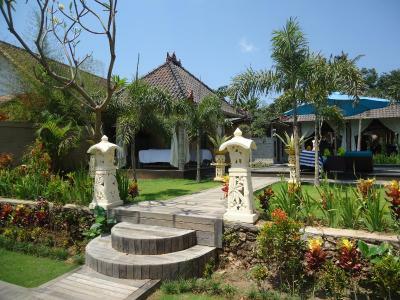 Good location, close to the beach and port, easy to find restaurants, shops and diving agents nearby. Comes with in house massage with reasonable price. 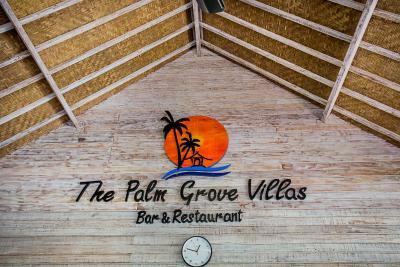 We had a fabulous stay at Palm Grove Villas. 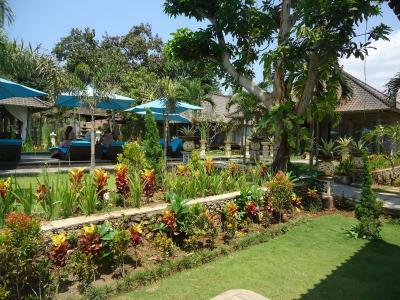 Our room was cleaned beautifully each day and the grounds were kept immaculately. The staff were so helpful & friendly. 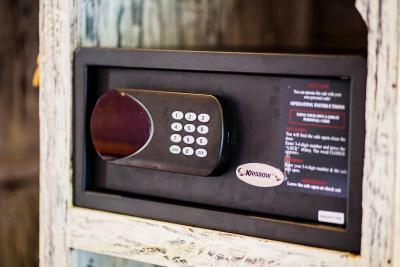 Our safe malfunctioned & within 1/2 an hour it was replaced. The included breakfast options were the best we had during our stay in Indonesia. March was a great time to visit as it was low season & not busy. 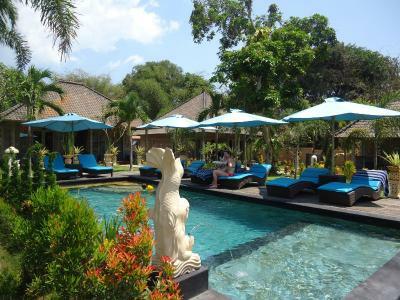 There was 2 pools to relax by & the villas were centrally located to the beach and nearby restaurants. We hope we can return one day. I didn't find the menu of the Restaurant very exciting. Mainly western - few local dishes. The rooms are big and comfortable. 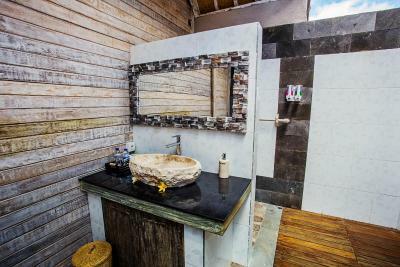 Outdoor bathroom was good too. The garden is lovely and so is the big pool. The bungalows are really close to Mushroom Bay. We woke up every night for some animals, perhaps gekkos. They made so loud noise on the bathroom and front terrace/roof so it sounded as someone was going to walk in to our villa. And we kept our shoes outside on the terrace, on one morning one of the shoes was found 50 meters away from our villa and it was broken, street dog maybe. The bathroom door was not possible to lock inside and the door had to be a bit open, you could close it with a key only outside. 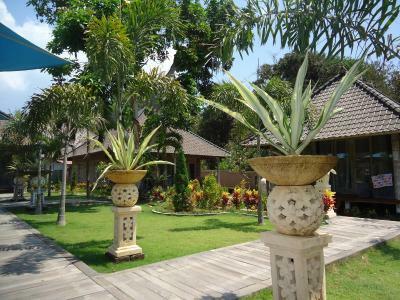 The villas were beautiful and nice, except the gekkos making noices at night. The service was good and breakfast tasty. It was easy to rent a scooter and see more of the island, though the other mirror was missing and there were no helmets available. 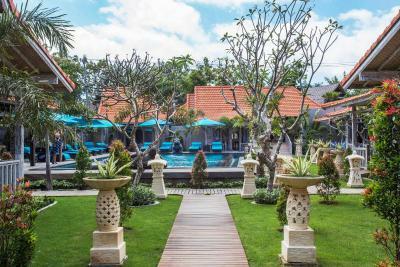 We were very happy with the accommodation surrounded by lovely gardens and pool .breakfast was excellent.cant wait to stay there again. Outside bathrooms had mosquitos, no mirror in room, no place but floor for suitcases. Nice large room, 2 pools. The beds!!! 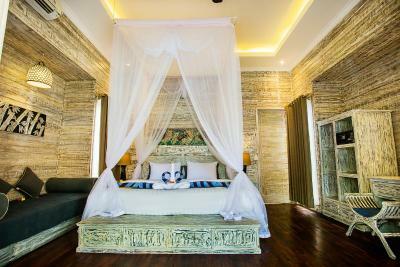 We were in villa 5 and the bed was almost unbearable, but because we were only there for 3 nights, we didn't complain. After all we had just spent 1 month in Thailand, land of hard beds. 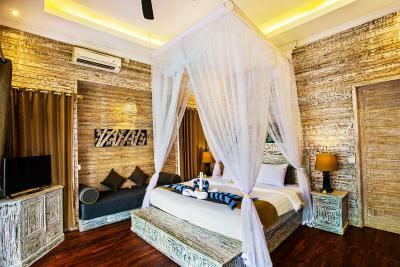 The bed would be my only complaint with Palm Grove. 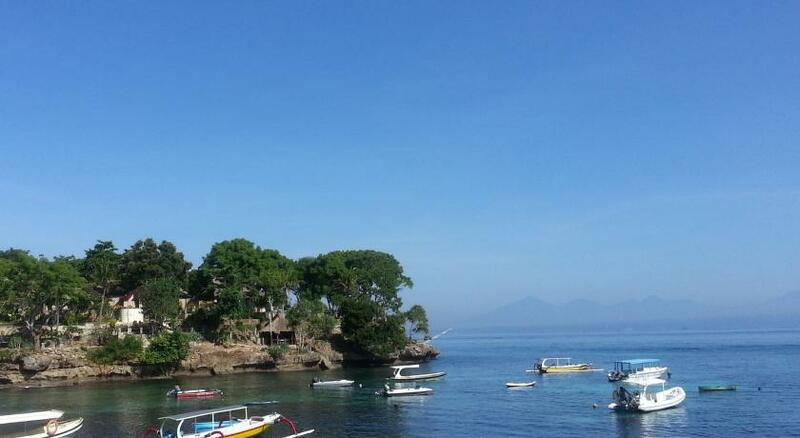 Mushroom bay is not really a swimming or sun tanning beach as all the snorkel and ferry boats moor here. We were in the section by the restaurant and we felt like we had our own private pool, as there are 2 pools at this resort. Staff were amazing and super friendly, always smiling and helpful with any needs. Could walk to lots of restaurants. Lgood restaurant was right across the street and the food was amazing and they had live music. 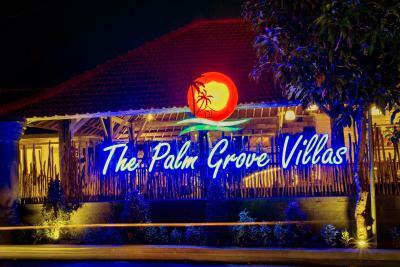 We ate dinner 1 night at Palm Grove and their food was very reasonable and delicious. Breakfast had a good variety and was included with our room. 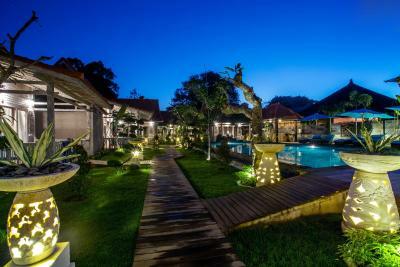 If we ever came back to Nusa Lembongan this hotel is a good choice and well worth the money.